Everything you need to know about live streaming setup, equipment, and other technical aspects to go live like a pro. Overview – What do you Need to Live Stream? How much internet do you need to live stream? Live Streaming doesn’t have to be as complicated as some set it out to be. Although to have an impact, they can’t be simplistic. What we mean by that is, it’s essential to have a thought process and a structure to your live streams. Even if you are sharing a spontaneous live video with your audience, you need a certain level of quality content and equipment. In this post, we’ll give you an overview of what you need to set up a live stream. We also talk about the need for different live stream equipment, depending on your live broadcasting goals. Here you will learn more about the live streaming gear available out there and how to structure your live streaming setup. There is a vast variety of equipment available for live video production, and the price point can go from ten to thousands of dollars. When deciding on equipment and setup, you always need to, keep your budget in mind and research prices thoroughly. More important than budget, choosing your live streaming setup will depend heavily on what kind of live video you are producing. For example, if you are building a personal brand and plan to do live streams related to lifestyle and vlogging, you might be better off with a mobile live streaming setup. But, if you plan to create webinars to grow your business, the structure is entirely different. Just like large in-person events will demand a much more professional setup. The point is, each live video requires different investments and equipment. The best way to start live streaming is to have a basic setup, versatile enough that gives you the freedom to try different things and still maintain a good quality stream. First and foremost, you will need a camera. Before you worry, it doesn’t have to be anything expensive. There are affordable cameras on the market and you can find the best camera for your live streaming. Webcams are one of the most common pieces of live streaming equipment out there and yet, one of the most efficient. They are easy to set up, and you can find high-definition webcams for as little as $40. The main setback when it comes to webcams is their need to be connected to a computer, which can be limiting. On the other hand, there are IP cameras. IP Camera is a digital video camera that sends and receives data via a computer network. In other words, they can communicate online, so you get more freedom during your live streams. You can find IP cameras with a good enough quality for live streaming, but the wireless connection can also bring you video latency. There are also streaming-ready cameras on the market. Live streaming cameras can be connected through a wi-fi connection, and they are easy to use. Though they can put out good-quality videos, they tend to be more on the pricey side, costing around $300. An excellent and highly-practical alternative for live streaming equipment is your smartphone. The video quality of smartphones keeps getting better, and you can find accessories to enhance it. For instance, you can get clip-on lenses for wide shots, stabilizers for live streams on the go, external microphones and so on. You can also connect your mobile phone to your computer and use it as a regular webcam or as a second camera. In other words, with your mobile device, you can have a multi-camera live streaming setup and deliver professional-looking live video, while saving money. When using your smartphone, keep in mind its battery life. On average, each minute you stream takes 1% of your battery. So, make sure you add a power bank to your live streaming equipment’s box. Other cameras can be used for live streaming, such as professional video cameras. Concerning quality and stability, they will deliver fantastic results. But, they require a significant investment and many accessories. As far as cameras go, some people use their DSLRs and camcorders, which deliver high-quality videos. Since these cameras were not built for live video, you run the risk of damaging your camera. To choose the right camera for your live streams, take into consideration what kind of video you plan to do and what’s your budget. Do you plan to go live in your office? You can create a small set, with a webcam and perhaps use your smartphone as a second camera. Are you going live outdoors? Then, your smartphone with accessories might be your best option. Regardless of your live streaming plans, it doesn’t hurt to have a couple of tripods. Shakey videos will cost you viewers, so make sure you strive for stability. Even if you get the best camera out there, it won’t mean much with poor lighting. The lighting of your “set” is vital to get the best quality out of your camera. Your shot needs to be bright with soft shadows. Harsh shadows create a more aggressive and less relatable feel to your video. Check out the basics of video lighting here. Typically, YouTubers, vloggers, and streamers have 3-point lighting. Which means, one main light diagonally across the presenter, a fill light on the opposing side and a backlight. This setup allows them to minimize the shadows within the shot. The backlight creates a depth of field in the scene because it separates the subject (presenter) from the background. 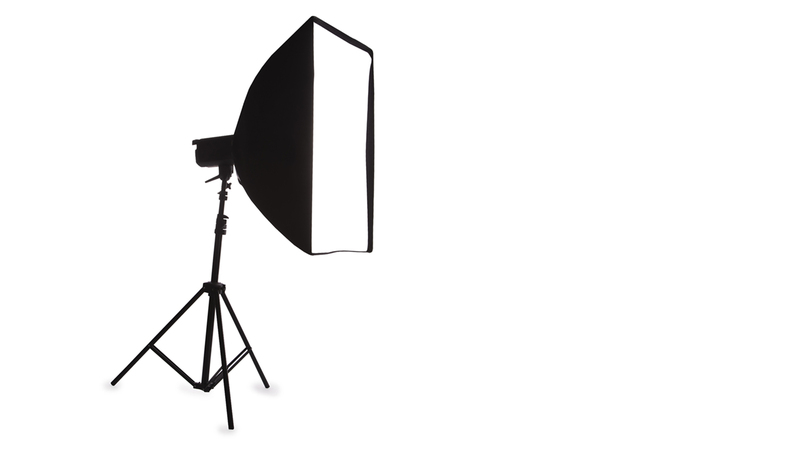 For around $100, you can get two continuous lighting kits, with softboxes. With this kit, you’ll get a shot with soft lights on each side of the subject, to minimize the shadows. The backlight will cost an extra $30, and you’ll have the 3-point lighting to help you deliver professional-looking live videos. The audio quality is as crucial as the image for the success of your live stream, if not more. To keep viewers interested and engaged in your live video, the audio needs to be clear. Choosing the best type of microphone for you will depend on the type of live streaming video you plan to produce. The prices vary a lot, but there are many affordable microphones on the market. For your live video, you can have a lapel mic, which is attached to the presenter’s clothes and it stays close to the mouth. Because of its positioning, the lapel microphone gives your stream a nice audio quality. But, if you have more than one person talking during your live video, it’s better to go for a directional microphone, which can be a desktop mic or handheld. If your outside, remember that the wind is not your friend and get a windscreen to protect your mic and improve your audio. Apart from the gear listed above, live streaming requires hardware power. Your computer will need software to process all the information it receives from the video and the audio. Then, the software will stream that information online. On top of that, your computer will probably be running other applications, like a PowerPoint presentation, websites and so on. You’ll need your system to be able to sustain all these activities with ease. Otherwise, your stream will be unstable, and it might lag or crash. The hardware specifications for live streaming vary a lot because it depends on what type of live video you’ll create. Game streaming, live webinars, and live presentation streams will require very different hardware. Another essential element of the live streaming setup is your internet connection. More specifically, the upload speed of your internet connection. To check your current connection, you can access Speedtest. It will give you the speed in Mbps, or megabits per second. So, you’ll be able to find out the volume of information your connection can transfer online per second. It’s important to keep in mind that, your internet speed will fluctuate, so always check it before a stream. For instance, if you have high upload speed, you’ll be able to put out high-quality streams with little to no lag. Whereas, a low upload speed, will require some sacrifices in term of quality to try and minimize the latency. The amount of Mbps used to stream your video will depend on your video settings and other variables. For example, if your video resolution is set to 1080p, it will require a higher bitrate than a 720p resolution. The higher the bitrate, the more internet bandwidth it takes up. Twitch, one of the most popular live streaming platforms, has tested various setups and came up with these broadcast guidelines. To bring all these elements together, you should have a live streaming software. It will receive the data being sent from your webcam and microphone, encode it and transmit it in a readable format to the platform you want. More than that, a live streaming software like ManyCam, will give you many features to enhance your live video and make it look professional. A live streaming software can also help you figure out the best live streaming setup for your equipment with automatic settings. You can always test out a few different scenarios, record on ManyCam and analyze the overall quality. Define the priorities of your live stream, and focus on improving them. When it comes to successful live streams, it’s all about testing everything beforehand and making sure things are working at their best. Having a live streaming checklist is essential. Equally essential is doing a dry run before the live broadcast, which can be done as a private video on platforms like Facebook and YouTube. To choose the right equipment for you, you need to define the type of content you want to create. The equipment you need to deliver live classes online and what you need for live interviews outdoors are completely different. Find what works best for you, according to your goals and budget. Hi Angela, depends on the teaching platform. Usually, inside the platform you can go to video/audio settings and choose ManyCam as your “Webcam” and as your “Microphone.” If it doesn’t work, please send us an email at support@manycam.com, our team will be happy to help. Thanks for your comment!